This chicken enchilada casserole recipe is cheesy, saucy, and easy to make with just the right amount of chipotle and spices. I made Chicken Tinga the other day and talk about delicious. 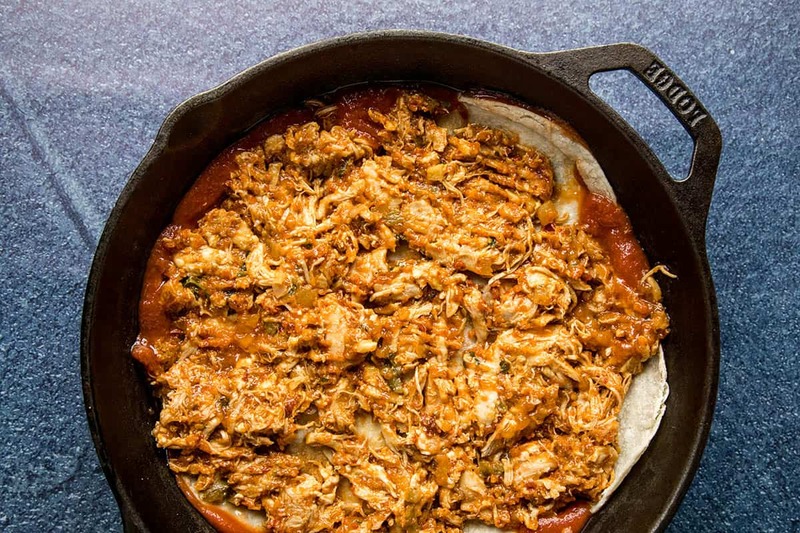 Chicken Tinga is basically shredded chipotle chicken, and it is incredibly versatile. 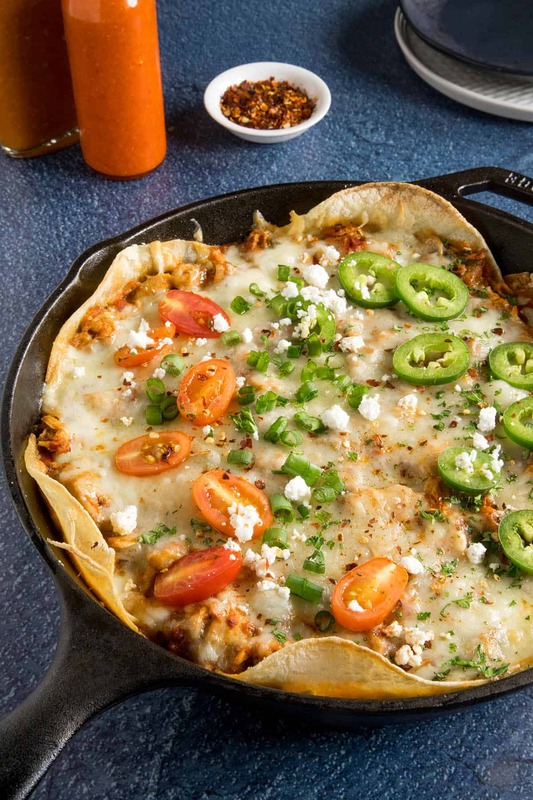 You can serve it on corn or flour tortillas as tacos, on larger tortillas with fixins as a chipotle burrito, on buns as your favorite torta, even over crispy corn tortillas for enchilada stacks. Or more! 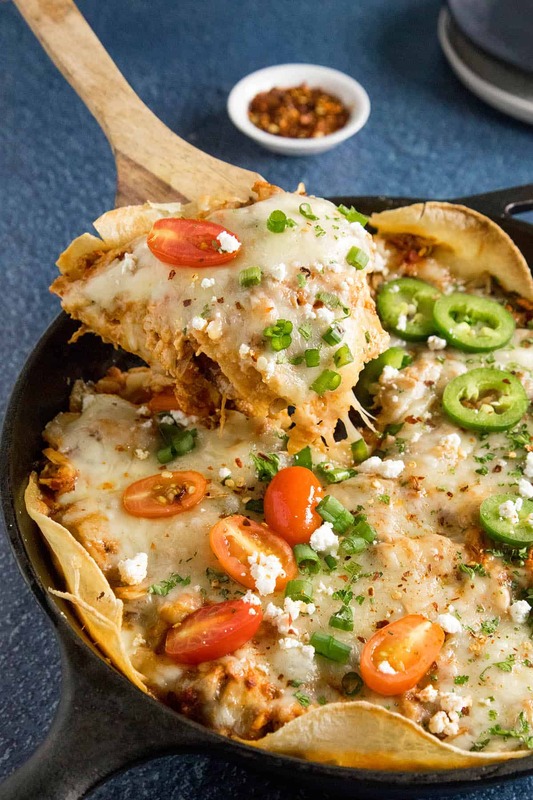 So many ways to serve your chipotle chicken tinga! Particularly, this way. 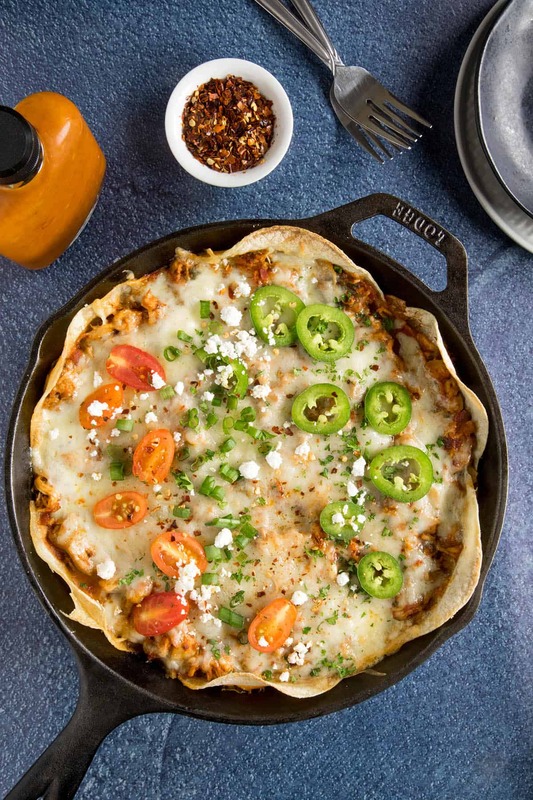 We’re talking Chipotle Chicken Enchilada Casserole, and as a spicy food lover, I’m sure you’ll love it. 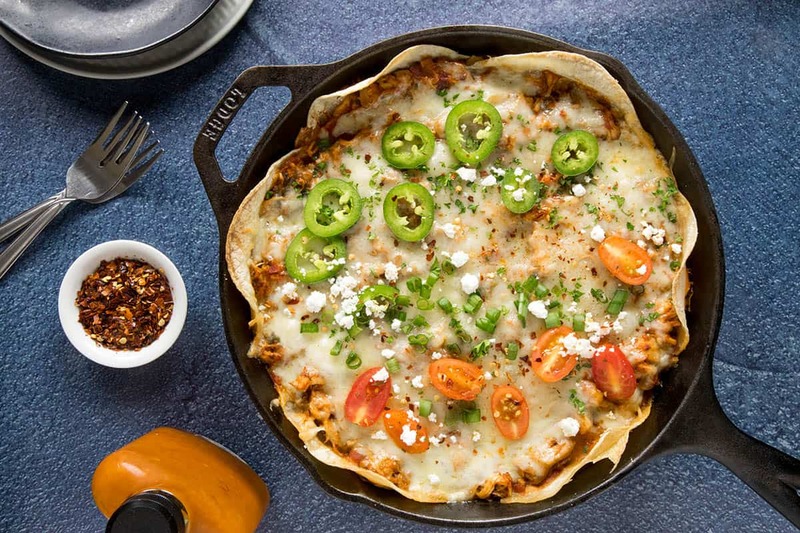 As far as this chicken enchilada casserole goes, it’s nice and cheesy with 2 cups of shredded Monterrey Jack cheese melted over the top, though you can accommodate more if you’d like EXTRA cheese. It’s also nice and saucy with a combination of tomato sauce and chipotles in adobo sauce. Talk about great flavor. It’s a nice dinner option for my spicy food loving friends, though it isn’t overly spicy or hot, just perfectly balanced with flavor. It’s also great for serving up for your game day party. Game Day Food! First, cook down some onions and jalapeno peppers in a large pan with a bit of oil, about 5 minutes, until they are softened. Season your chicken thighs with salt and pepper, then add them to the pan. Give them a nice sear on each side, a couple minute each. 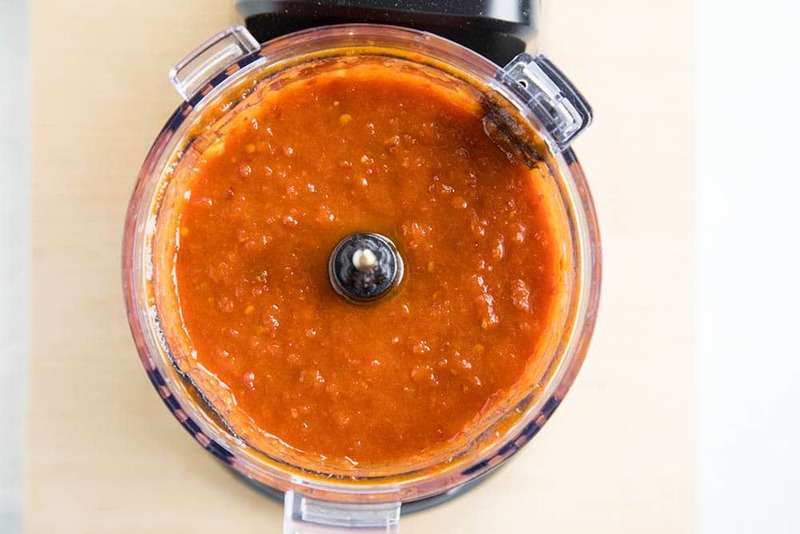 Process the tomato cause and chipotles in adobo sauce in a food processor. Pour the mixture into the pan, covering the chicken. Bring to a quick boil, then reduce the heat and simmer for 30 minutes, or until the chicken is cooked through and easily pulls apart. Remove the chicken and shred it with a couple of forks. Return the chicken to the pan and simmer in the sauce another 5 minutes. Next, preheat your oven to 350 degrees. 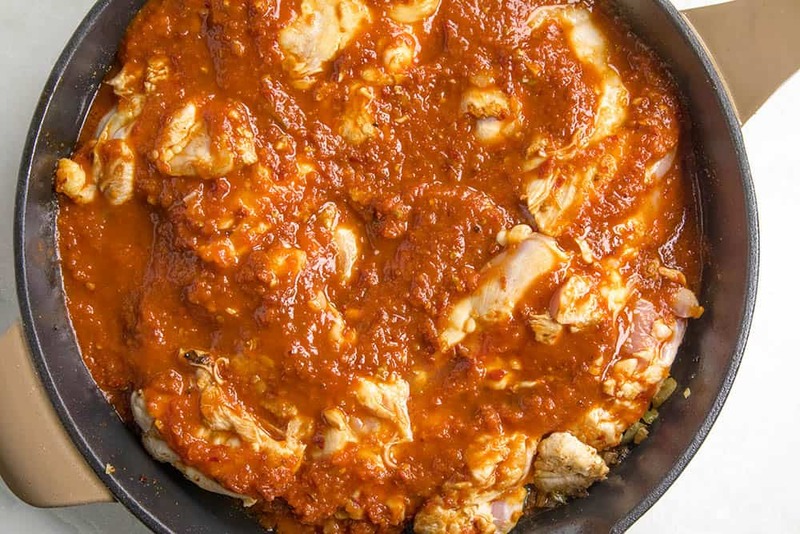 Spoon some of the sauce from the chipotle chicken into a 10-inch baking dish or pan. Lay half of the tortillas into to the dish, then spread half of the chipotle chicken over them. Top with half of the shredded cheese. Repeat with the remaining tortillas, chipotle chicken and cheese. Make it nice and cheesy, my friends! 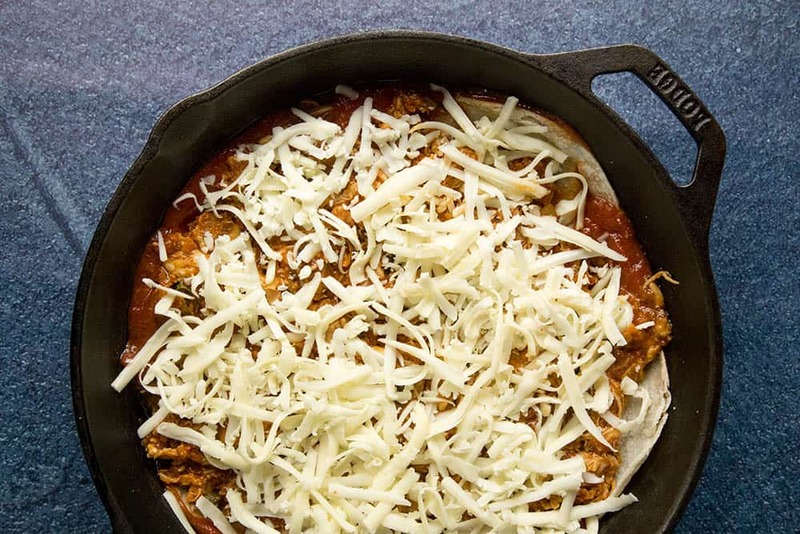 Bake the layered enchilada dish for 20 minutes, until the cheese is nice and melty. It looks so AWESOME, doesn’t it? Because it is! I love this dish. Crazy tasty. 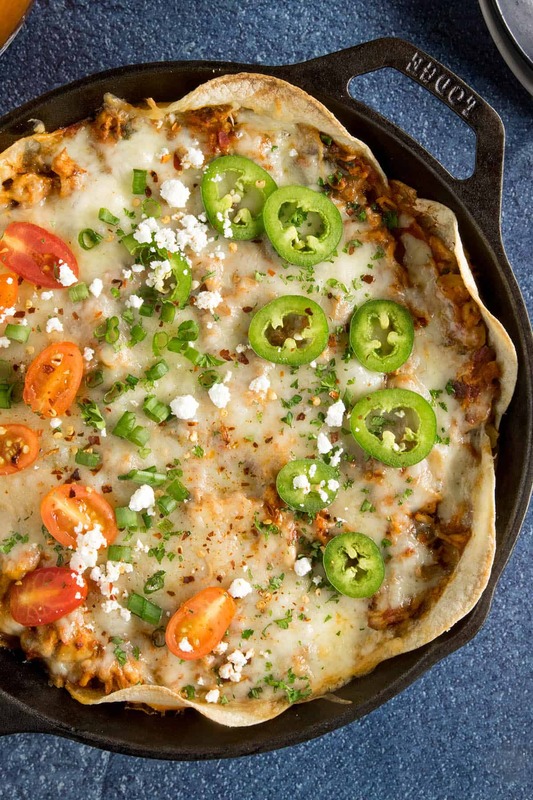 You can very easily add in other ingredients and keep the spirit of the Mexican chicken enchilada casserole. Some other ingredients would be black beans, pinto beans, refried beans, roasted corn, even chorizo. Feel free to include extra jalapeno peppers, or spicier peppers, like the serrano or a habanero pepper or two. Top it up with avocado or like me, with chopped or diced tomatoes, sliced jalapeno peppers, crumbly white cheese and chopped green onion. Don’t forget the spicy chili flakes! Or your favorite hot sauce! You can’t go wrong with a bit of extra spice! That’s it, my friends! I hope you enjoy my Chipotle Chicken Enchilada Casserole recipe! It’s a new favorite! 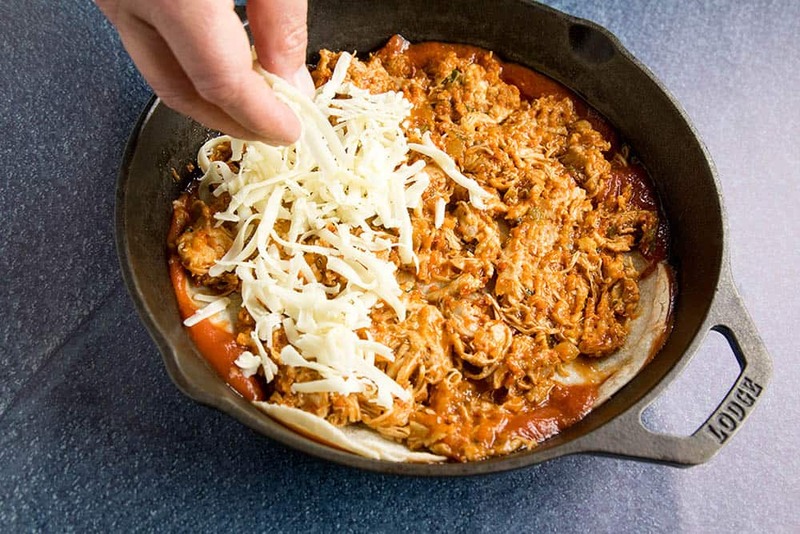 Be sure to check out my Chicken Tinga Recipe. Heat the oil in a large pan to medium heat and add the onions and jalapeno peppers. Cook them down about 5 minutes. 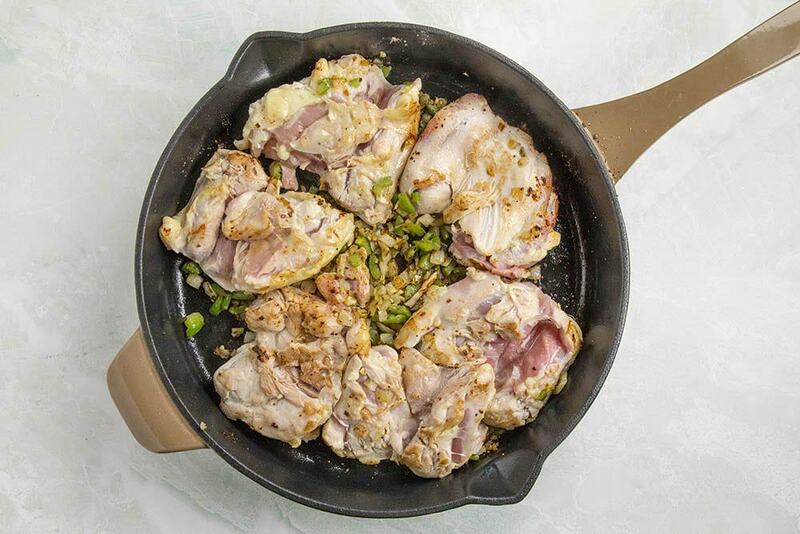 Season the chicken thighs with salt and pepper, then add them to the pan. Give them a nice sear on each side, a couple minute each. Process the tomato cause and chipotles in adobo sauce in a food processor, then pour the mixture into the pan, covering the chicken. Repeat with the remaining tortillas, chipotle chicken and cheese. Heat Factor: Mild-Medium. But it's big on flavor and zing. 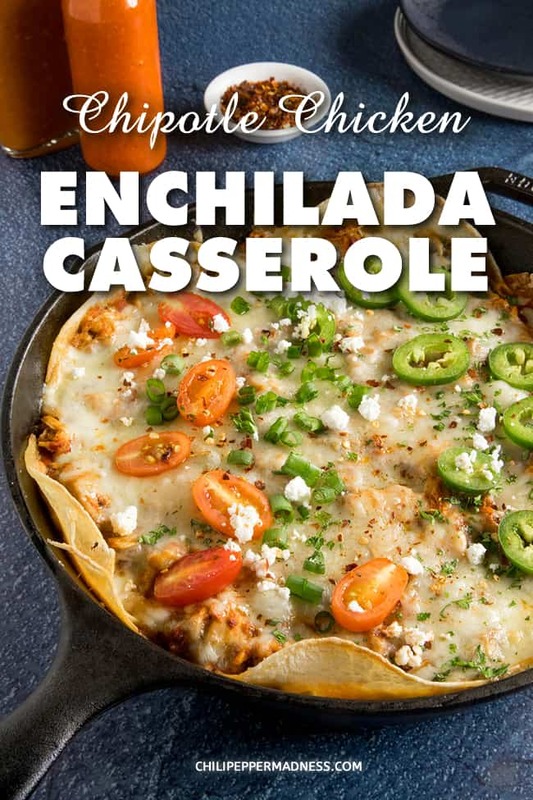 This enchilada casserole looks great! I love using chipotle peppers in adobo sauce! The sauce really makes it. I am loving this. What a great way to put together a meal in one pan. Definitely going to serve this up soon. My family will love! I’m sure they will! Thanks, Valentina. I haven’t yet tried an enchilada that I truly loved, and your version is made with all the ingredients that I love. I need to give this a try! I think you’ll like this version, Diana! I love chicken enchiladas. I’ll have to use this recipe the next time I make them. Is this made with soft corn tortillas or “crispy” corn tortillas, like the ones used for nacho chips? Barbara, this recipe uses soft corn tortillas. Let me know how you like it. Enjoy. This needs to happen soon for dinner! Looks crazy delicious! !